We’ve just launched a major update to Protopage, which includes brand new mobile features. 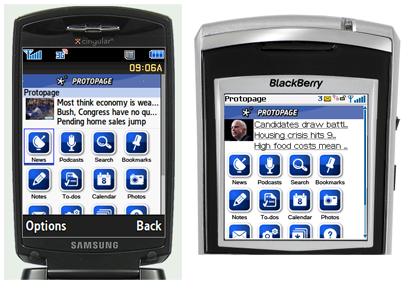 Protopage Mobile has been specially optimized for dozens of mobile phones including the Apple iPhone, Blackberry, Nokia, Motorola, Samsung, Sony Ericsson, LG, Windows Mobile 5/6, HTC and Palm. 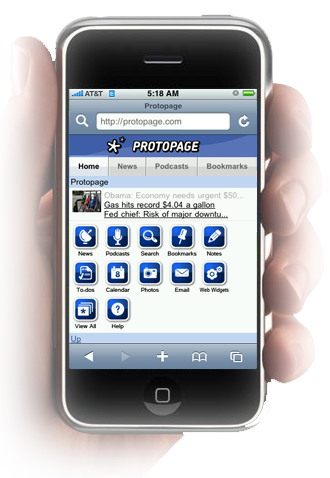 To access it, simply visit protopage.com/mobile on your phone. News feeds are automatically optimized for download speed and for your phone’s screen dimensions. 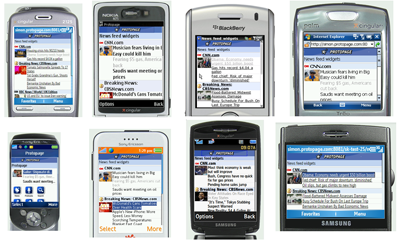 Protopage Mobile works great on both 3G and older 2G phones. You can speed up access to news feeds even further by disabling images from the ‘Edit settings’ link at the bottom of the Protopage Mobile page. You can use Protopage Mobile to read your news feeds, listen to your podcasts (requires a phone with a compatible media player), search the web, access your bookmarks, view your sticky notes, keep your to-do lists, view your photos and even check your calendar. We’ve also been busy working on the web version of Protopage. By popular demand, we now support column layouts that let you choose between 2,3,4 or 5 columns on your page. Uniquely, you can resize widgets to span multiple columns, which is useful for larger widgets and cartoon strips. We’ve made a number of aesthetic and usability improvements, including an option for larger font sizes and simplifying the tab and toolbar system. We’ve tested Protopage on a very broad set of phones, but please let us know if your particular model has any issues and we’ll see what we can do! Please also let us know if you’ve spotted any bugs by using our feedback form. Thanks! This entry was posted on Wednesday, July 9th, 2008 at 9:28 pm	and is filed under new features. You can follow any responses to this entry through the RSS 2.0 feed. Both comments and pings are currently closed. Is there a way to move the Widgets/Mobile/Color/Settings tabs back to the bottom of the page? My whole page has been bumped down half an inch for items I will rarely use. Also, all my links are underlined. Since everything on my page is a link, EVERYTHING is underlined. Is there an option to turn this off? I liked the old layout much better. Can you create a “classic” option so I can switch back? Looking good – Thumbs up ! More and more space keeps getting eaten up with new updates, wasted space on the page. Rearranging suxx0rs. I agree about the Add/Settings/Help bar, it needs the option to move it back to the bottom. Love the idea of PP Mobile though and will check that out as soon as I can. Agree about the settings. Also the tag is no longer rendered as a horizontal line in link labels. Now prints the text . That was good for visually separating longer lists of links into groups (with a blank http:// as link) . Workaround could be to use underscores but not as good. by tag I meant HR Tag. congratz on the nem mobile version!! As soon I get my hands on a web-capable mobile, i’ll try it. And if it’s possible, it would be very fine to have the rounded borders back too… as an personalization option, of course. The angled borders are visually tiresome (it’s proved by usability studies). Thanks you very much, and keep up the great job! We’ve just released a new option in ‘Colors/Settings’ to allow you to have rounded corners again. You guys are amazing! Everyone should try out protopage and see how great it is!!! The underlining of links also seems to take up more screen space now compared to before, my RSS feeds nearly all have scroll bars which they didn’t have before…. I agree with the other posts: this is the best start page on the web, but the settings tabs need to return to the bottom of the screen. Thanks. I agree with Craig who agrees with everyone else: This is the best start page out there. I also agree about the settings. They should move back to the bottom. Change is bad!! please give us an option to hide/put back at bottom. thanks for the updates. Love the mobile. I love the settings at the top, as it makes me thankful for having a huge screen. There’s a huge gap at the bottom of my Protopage where the old tabs were, but if I increase the size of the widgets, scrollbars appear. Isn’t there some setting you could increase so I can have my widgets nice and big and my page scrollbar-free? Merci. I have to agree with most comments on here. The options bar along the top needs to go somewhere else, its obtrusive and takes up too much page space. How about having it appear when the mouse rolls over it, or appear when you click the double arrows to change tab category. Also the pointless search bar in the top right needs to go. The background colour behind the tabs doesn’t match the rest of the page. The news links are now underlined and take up a larger line meaning all my widgets need resizing, which I can’t do as the options along the top have taken up too much page space. There is still a bug when a pop-up widget contains drop-down boxes, and they happen to occur over other widgets (and I’ve used the feedback a number of times to report it). All in all, this update has brought little in the way of functionality and I would argue that it has caused headaches for most users – especially those long time fans. I don’t wish to knock the Protopage teams efforts, but I feel this release wasn’t properly tested and/or thought through very well. As a Protopage user from the very beginning, I have always received excellent and prompt action when I have provided feedback. We all agree that the option bar has to be moved, but would anyone else have noticed the new Mobile page if the intrusive button were not right there at the top of the page??? I’m using it on my mobile only because I saw it at the top of the page. We pay Protopage nothing for the most customizable startpage on the Internet. 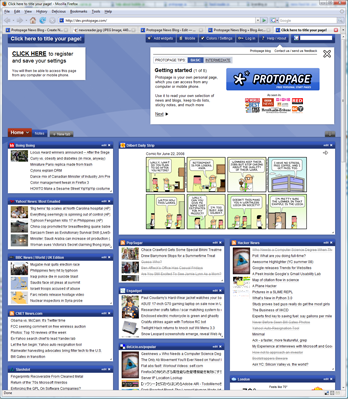 Protopage has been my startpage since 2005. We all understand that you have to get the word out about new products and features. Make the “tabs at the top” the default for new users and let the rest of us put things where they belong… back at the bottom. Thanks, Alvin. Simon et al have a good point about the top toolbar and the link underlining. We didn’t quite realise how precious screen space was to many of you. Simon’s idea of an ‘expand’ option so that the page title, search box and toolbar buttons are normally hidden unless expanded we think is an excellent idea. We’ll implement this and put an option in the ‘Colors/Settings’ section to enable this shortly. Simon – please could you elaborate on the ‘pop-up widget containing drop down boxes’ – we weren’t sure what you meant. hurray more change is coming, yayyyyyyyyyy! Simon, the ‘drop down list’ bug is a pretty rare problem that is specific to Internet Explorer and is something we’re unable to fix unfortunately. Firefox however handles your particular situation perfectly (and is a faster browser than Internet Explorer too). You may want to consider switching. Again, as seems to happen every now and then, I have been away for a while. I can’t even say how long it was, nor do I have a good reason for staying away all that time. Anyway, I’m happy to see the ProtoTeam still rolling out new good stuff, and still listening to the users. You guys never cease to impress me. Really happy to be back, I immediately feel at home on my startpage. Thank you ProtoTeam! I’ve just spotted the ability to hide the top menu bar. This works perfectly, and it even gets rid of the search bar which I never used. Now, for a question, why does the top area appear in a striped colour, or is this another IE “feature”? @Simon: Yeah, the compact top area is cool, isn\’t it? They\’ve done that very well. I think the striped color top area is indeed an IE “feature”. In Chrome and Firefox, that area is like an overlay with very high (90%+) transparency setting. I’m guessing IE doesn’t handle transparencies that well. Please let me know what I’m doing wrong. There is no point in creating a protopage when no one can see it unless you are logged on. I don’t want to be logged on for the public to see it because then they can change it without me knowing. @Sohnia: When I view my own protopage (nothing special, look at http://www.protopage.com/freebee), I don\\\’t need to be logged in. I think you made your pages in the private category in stead of the public category. The private category is visible only to the people who can log in to it, but the public category normally also shows if you\\\’re not logged in. So please check in your top area, in which category your pages are put. It should be easy to move them to a different group and make them visible to the public. Umm… This is not good. Since you took the decision to hide the top menu bar, when I connect via another PC there appears to be no way of signing in. This is not good. I have tried with IE8b2, IE7, FF3 and GC. Thanks for the reply. I’ve tried GC and FF3 and still both show the top are as striped. I’m not quite sure what you mean by 90% transparency setting. At first I though you meant they had tried to mimic Vista Aero (glass? I haven’t and don’t intend to adopt Vista), but it doesn’t appear that way to me. Well, if it still appears striped to you, even in other browsers, then it must not be an IE feature after all. What I meant with the transparency thing is: it just looks like a sort of glassy overlay like a HUD. I don’t know about Vista Aero nor do I recall having set anything to get this transparent effect. What is that new white box on top of the page? There’s just a close button, but no text. I can’t write anything inside either. For me that box contained some commercial. I was sure that kind of stuff would never happen here, but maybe the Protopage Team has rethought their strategy. Please help…all of a sudden my login button has disappeared from the top of my protopage??? FreeBee, don’t panic! Everything is good at Protopage. Frank – the problem is most probably that you enabled the new “Compact top area of your page” option from the Settings tab. This hides all the buttons, including the login button, until you click the double down-arrow button in the top right of the page. Hope this helps! Now that’s weird. Just click the little “x” in either of the boxes, and you won’t see any more commercials for the entire session. Why would you leave, just because you have to click once? You mean “…because you have to click everytime you visit the page”. When you want to buy a piece of cellphone, I think the smart phones will be your first choice. Along with the develop of the society, people all like to run after automation products, so this Android smart phone i9300 will attract your attention. Provato Ieri sera. Prime impressioni molto psvtiioe. La grafica non sar fotorealistica ma molto curata e stilisticamente azzeccatissima. E’ possibile scegliere tra 5 diversi sistemi di controllo: 1)Wiimote verticale2)Wiimote orizzontae (Wii wheel)3)Wiimote + nunchuk4)Classic Controller5)Pad Gamecube Il gameplay ovviamente di natura arcade; il senso di velocit ottimo grazie anche all’utilizzo di massa del NITRO (NOS) che potrete caricare al massimo con una partenza perfetta e soprattutto con derapate, accelerazioni e scarenate coi vostri avversari nel corso della gara. Attraverso una barra presente nella parte inferiore dello schermo potrete costantemente visualizzare la quantit di Nitro a vostra disposizione.Giocando a modalit carriera partirete con un budget di 10.000 $. Con questa cifra potrete acquistare inizialmente uno tra questi 2 veicoli:il vecchio furgone della wolkswagen oppure una renault 4.In questa modalit primeggiando nelle varie competizioni (che si suddividono in gare tradizionali, di accelerazione, di derapata, ad eliminazione, di velocit massima, giro veloce, ecc ) vincerete denaro che vi servir poi per acquistare nuove auto sempre pi belle e potenti. Durante le gare “tradizionali” il vostro veicolo potrebbe subire dei danni che potrebbero comprometterne la stabilit in curva e l’utilizzo del Nitro. Grazie a delle enormi chiavi inglesi e distintivi della polizia presenti in vari punti dei tracciati sar possibile riparare in corsa la vostra auto oppure liberarsi temporaneamente dalla morsa di quei maledetti piedi piatti!In ogni singola competizione a seconda del vostro risultato vi verranno assegnate un certo numero di stelle (da 3 a 5 per ogni gara) che serviranno a sbloccare nuove aerografie, nuove auto, e in particolar modo a proseguire la vostra carriera, inseguendo la gloria sulle strade cittadine delle pi importanti metropoli del mondo (Si parte da Rio de Janeiro), spesso tallonati dalla Polizia, che tenter in ogni modo di fermare la vostra spericolata corsa verso la vittoria.